At Clapham School we believe in the power of art and music to inspire and shape the affections of our students. The classical tradition called this musical education or an education inspired by the Muses. From earliest grades all our students study the foundational skills of art and music, led by our exceptional faculty members. 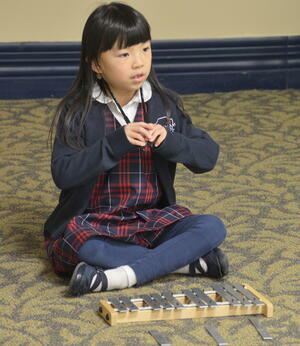 They also learn to appreciate the tradition of great artist and composers through studies with their homeroom teacher. From Explorers (PreK) through Grade Eight, they study the great works of a different artist and composer each semester. In this way, they come to know and love a host of the best paintings and compositions of all time. Every year students perform in our annual Christmas Concert and Spring Fine Arts day. 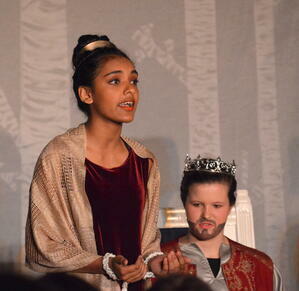 Our Middle School students perform a Shakespeare play. And Upper School drama students perform scenes and monologues or a play. Student musicians and ensembles also perform at a variety of other Clapham events throughout the year, like Grandparents Day, the Fall Benefit or the Spring Faire. Student artwork is regularly on display at the Wheaton Public library and during our Fine Arts day every year.